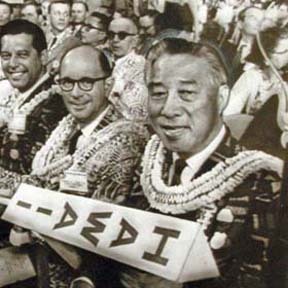 Sen. Hiram Fong sits with other members of Hawaii's delegation at the 1968 Republican National Convention in Miami. Fong, who worked his way from the streets of Kalihi to graduate from Harvard Law School and become the first U.S. senator of Asian ancestry, died yesterday at age 97. »Ching scores key goal for U.S.